A weekly symposium for artist and writers working in various text-image forms: comics, picture-stories, animation, etc. to present and critique current work. The symposium offers an ongoing place to learn and think about the traditions and future of text-image work. George Herriman’s biographer Michael Tisserand revisits the years when boxing, funny animals, and the one cartoonist’s genius produced comics’ most enigmatic character. 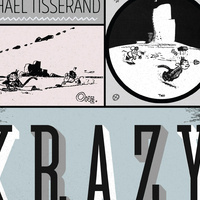 Michael Tisserand’s biography of George Herriman, Krazy: George Herriman, a Life in Black and White will be published by HarperCollins in December 2016. His previous books include The Kingdom of Zydeco and the Hurricane Katrina memoir Sugarcane Academy. He lives in New Orleans. Sponsored by Parsons School of Design.